!! 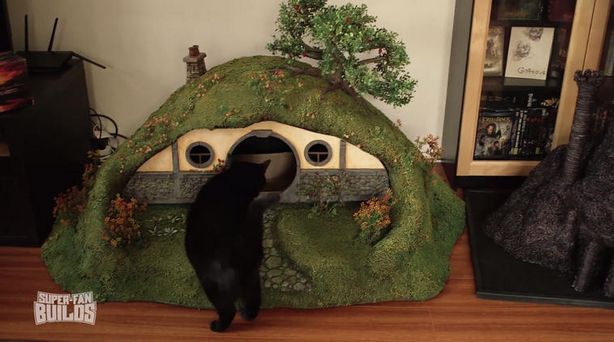 OMG, it’s the ‘Lord Of The Rings’ Litter Box & Cat Scratching Post !! Are you a crazy cat lady AND a big LOTR fan? Well then why not try and get your hands on a LOTR/Hobbit litter box and cat scratching post!? The Hobbit-hole is covered with lush greenery and has a stone walkway leading up to the round door through the cats go through to do their business, and the Tower of Sauron scratching post offers both a comfortable place for Misha’s kitties to scratch and an imposing warning to visitor cats who dare try to use Frodo and Sam’s scratching post as their own. Check out their creation below! Be the first to comment on "OMG, it’s the ‘Lord Of The Rings’ Litter Box & Cat Scratching Post"